Thursday, March 27, sunrise. The slender crescent moon will be just to the left of Venus, which will appear as a miniature crescent in small telescopes. 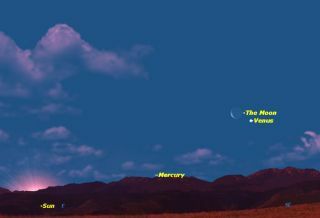 Early-bird skywatchers take note: If weather permits early Thursday (March 27), a celestial treat awaits observers who venture outside an hour before sunrise as two of the brightest objects in the night sky — Venus and the moon — shine together. To see Venus and the moon together in the night sky, you'll need clear weather and an unobstructed view toward the east-southeast. You'll immediately notice the crescent moon, which should appear as slender sliver with only 15 percent of its disk illuminated by sunlight. Hovering below and to the right of the lunar crescent will be the planet Venus, shining like a brilliant silvery-white celestial. While Thursday morning's Venus-moon meet-up is not an exceptionally close approach between the two objects, their great brilliance makes them an eye catching sight in the early morning sky. Of course what we'll see it an illusion of perspective. The moon will be about 226,000 miles (364,000 km) from Earth, while Venus is 292 times farther away at a range of about 66 million miles (106 million km). Venus just passed its greatest western elongation — its greatest angular distance west of the sun — on March 22. But it will still remain at nearly the same height above the dawn horizon for viewers at mid-northern latitudes, and will shines at nearly the same brilliance for a number of mornings to come. Venus rises in the east-southeast shortly before 5 a.m. your local time all month long. The eerie, low glimmering of Venus is a harbinger of daybreak, which will begin only 15 or 20 minutes later. In a telescope, Venus's illuminated portion has fattened to just over half full. And once you know where Venus is relative to the moon, see if you can see it after the sun has come up. You should have no problem glimpsing it in the daytime; a tiny white speck against the blue sky. Editor's note: If you snap a great photo of Venus and the moon, or any other night sky view, and would like to share it with Space.com for a story or gallery please send comments and images to managing editor Tariq Malik at: spacephotos@space.com.